RingSide has been helping Portlanders celebrate in style for 70 years now. My parents were married in June 1949, just five years after RingSide in Portland served its first steak. When it came time for Dad and Mom’s golden anniversary in 1999, there wasn’t even a question about where we would hold their celebration. RingSide Steakhouse, with its tradition of culinary excellence and impeccable service, has been serving the best aged steaks, prime rib and those amazing famous onion rings for generations now. With my own RingSide family tradition going back nearly to the beginning, just imagine how thrilled I was to be invited to the media preview event for their 70th Anniversary celebration. Held in the Ringside’s sophisticated Barrel Room, the preview event gave Mr. B and I a taste of the celebratory menu as well as a glimpse into some of the exciting new additions and improvements at RingSide. Mr. B and owner Craig Peterson talk food, golf and their bygone days growing up in Portland. RingSide has a long history of helping Portlanders celebrate in style, and they have quite an elegant party planned for their own Platinum Anniversary. Spanning the entire month of June, the celebration includes a distinctive anniversary menu. A portion of the proceeds from the events will go toward helping New Avenues for Youth, an organization that serves homeless and at-risk youth. When we arrived at the event, we were greeted with platters and glasses full of delectable bites and sips, and all around us, servers stood at the ready to carve us off samplings of the celebratory menu trio of beef. The Rib Eye Cap (above) was charbroiled and sliced in a simple presentation that allowed its fabulous flavors to take center stage. 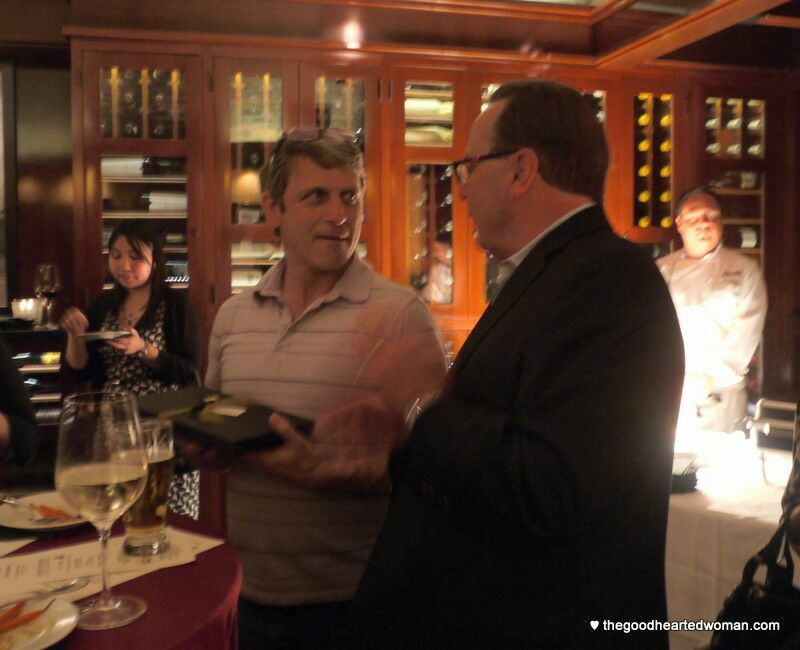 Mr. B and owner Craig Peterson agreed that the Rib Eye Cap was their favorite of the beef trio. 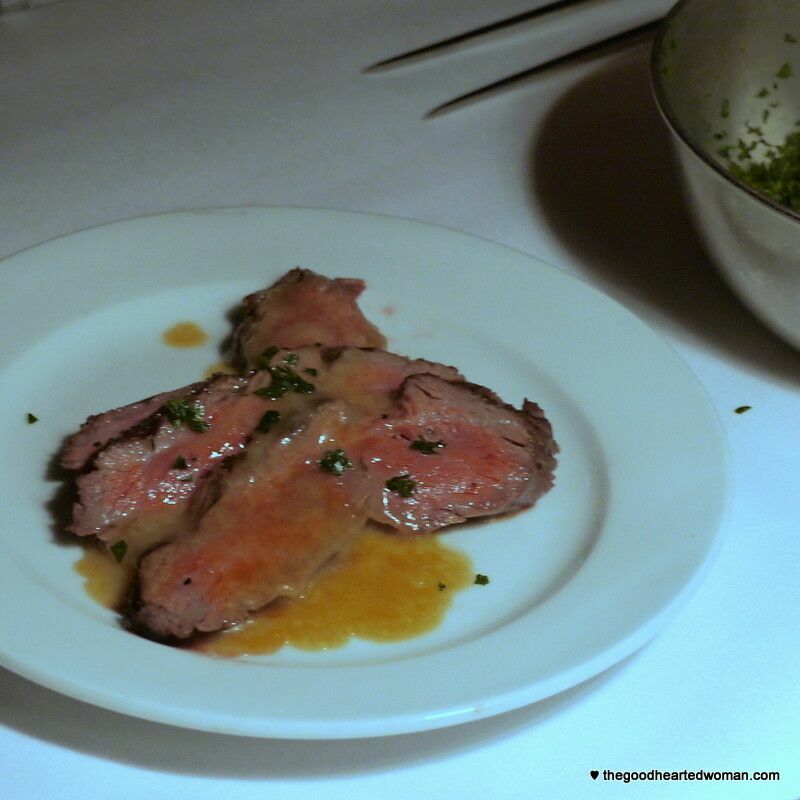 The Tenderloin Beef Oscar was my favorite. (They had me at Crab Leg.) This fork-tender Petite Filet Mignon comes topped with the aforementioned Dungeness crab leg, shaved asparagus, and a delicately decadent Béarnaise. The best of all worlds wrapped up in every bite! 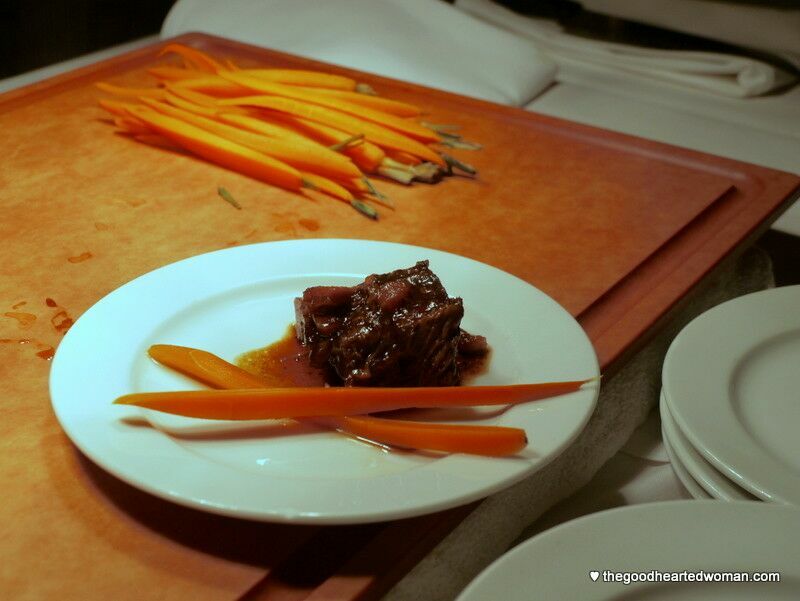 Many at the event deemed the Braised Short Rib the best of show. 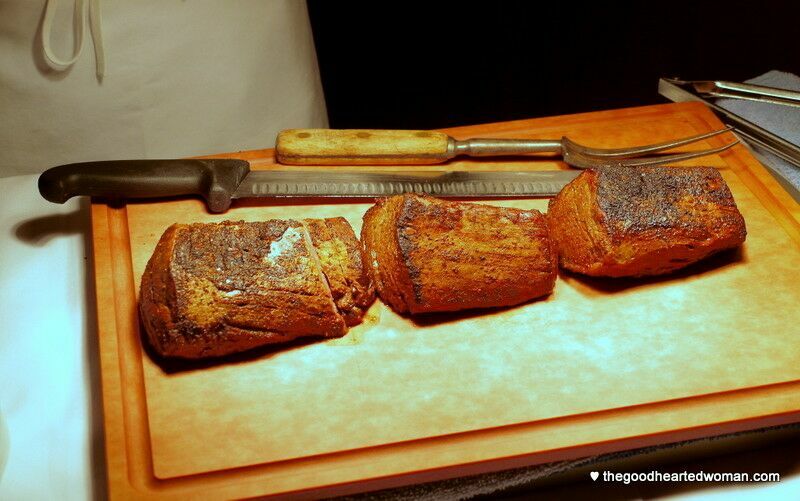 The meat is so tender that it falls apart at fork’s first touch. Not actually braised, these short ribs are cooked using a technique known as “sous vide” in a hot water bath for 24-30 hours. Once complete, they are served with a rich demi-glace. In 2010, RingSide underwent some major renovations, designed to grow the operation and continue its tradition of excellence. 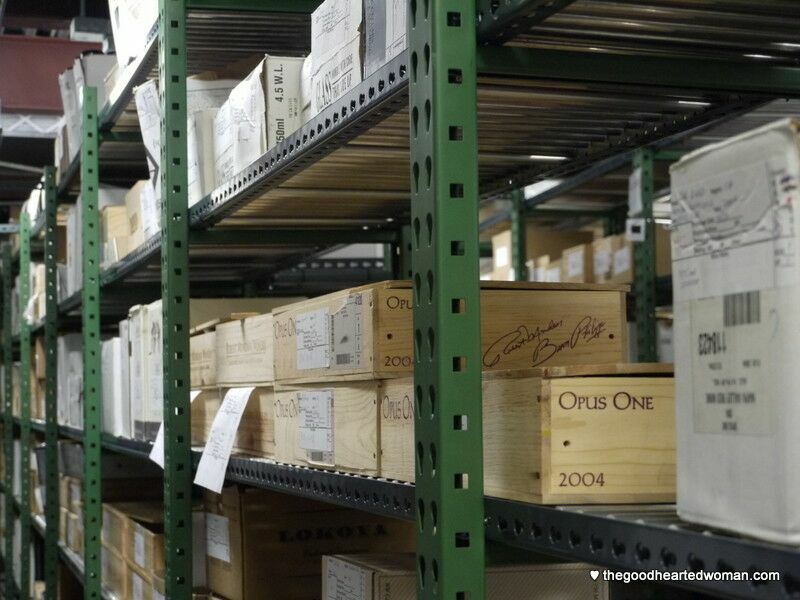 Most took place behind the scenes – or under the scenes in the case of the new climate-controlled wine cellar. Third-generation owner Jan Peterson is passionate about wine, and serves as RingSide’s wine curator. She shared that she loves the labels, and is intrigued with what people will do to make their labels unique to their wines. 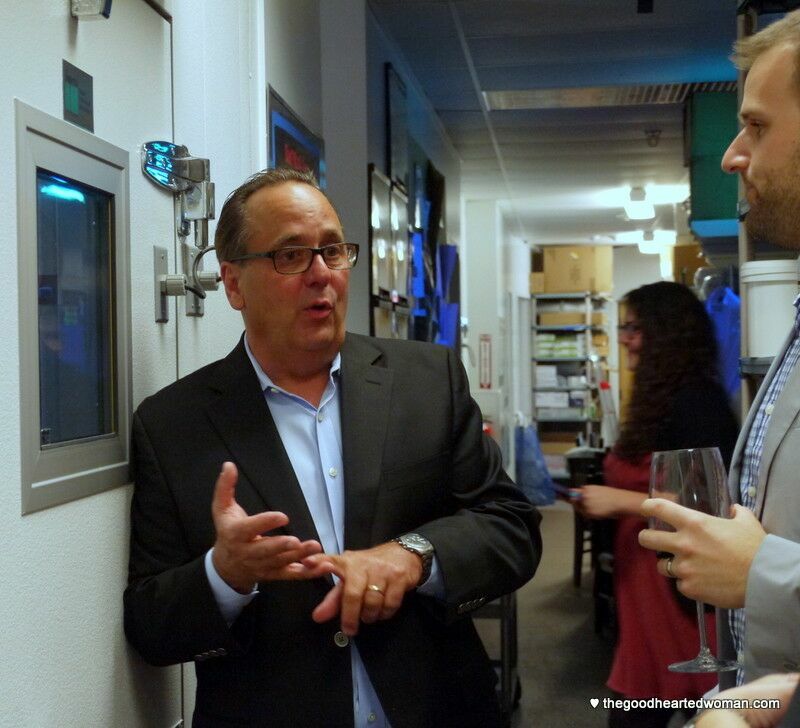 Mr. B is our resident wine expert, and he was captivated by Jan Peterson’s tour of the wine cellar. 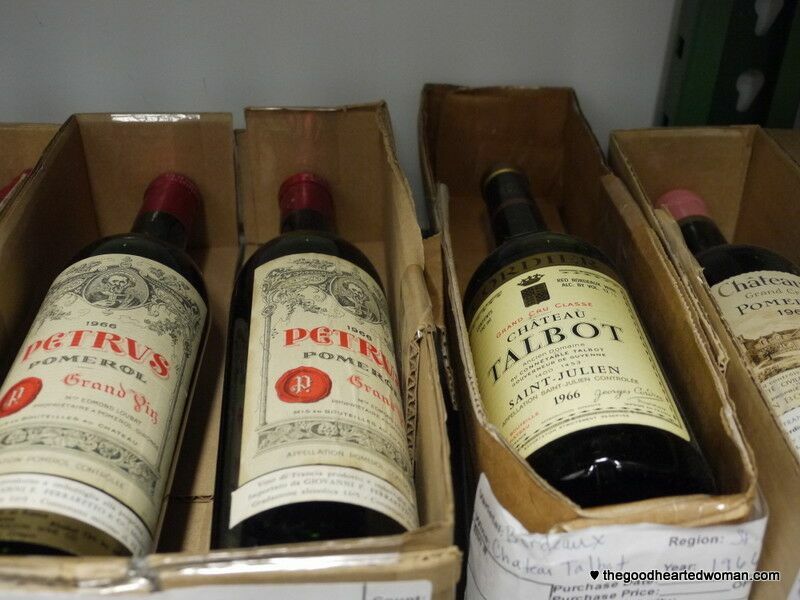 The cellar houses a very impressive collection of local and international wines, 90% of which are reds, including the pricey 1966 bottles of Pomeral pictured below, worth about $2000 each. (I missed the picture of their expensive little brother – a $10,000 bottle, vintage 1982.) And lest you think those tony bottles are just for show, let me tell you that Jan shared that she had sold a $10,000 bottle of wine earlier in the week. She commented that she was sad to see it go, but glad that someone was able to enjoy it. 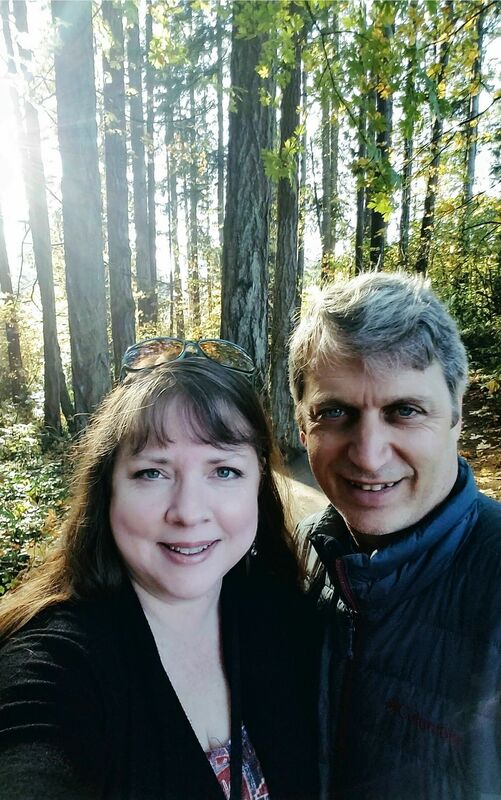 The Peterson family are home-grown Oregonians to their roots, and very supportive of local pinot noirs. 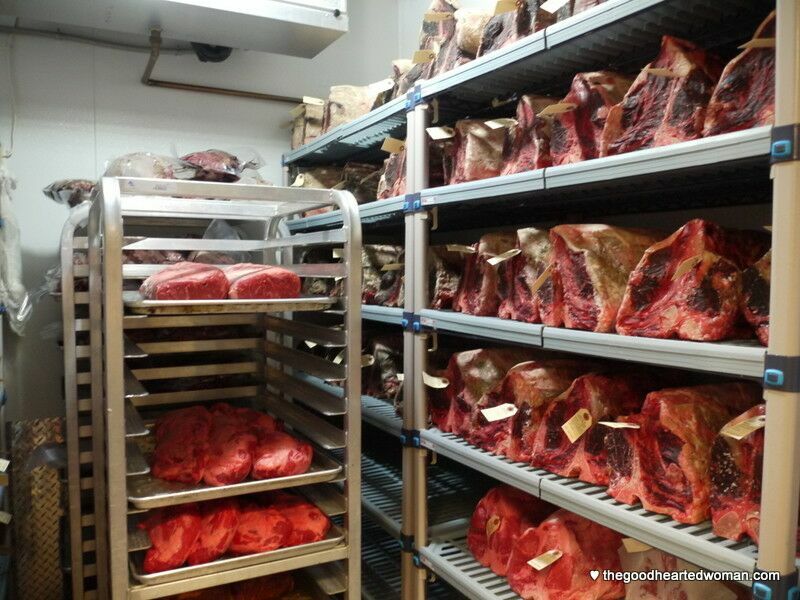 Our tour continued as owner Craig Peterson gave us a tour of the new dry aging meat locker and newly expanded kitchen. Mr. B and I were both so impressed by the Peterson family owners and their commitment to excellence in Portland’s dining community. Listening to them talk made it clear that RingSide is much more than just a business for them. Beef in the aging room is held at a steady temperature for 26-31 days, with the entire stock being cycled through about every 3 weeks. Because temperature and humidity control is so critical – if either is compromised, they can lose the whole contents of the meat locker – RingSide has a sophisticated backup system in place to guard against loss. 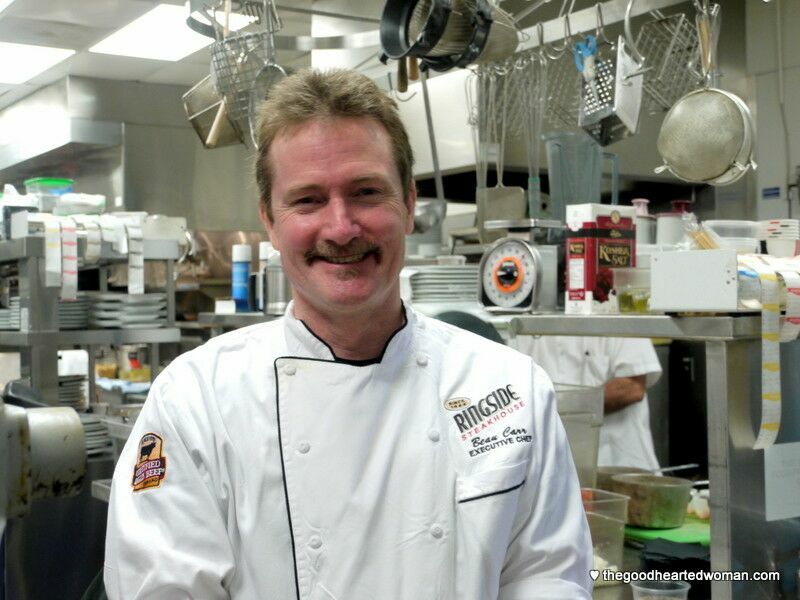 RingSide Executive Chef Beau Carr had a smile for everyone! 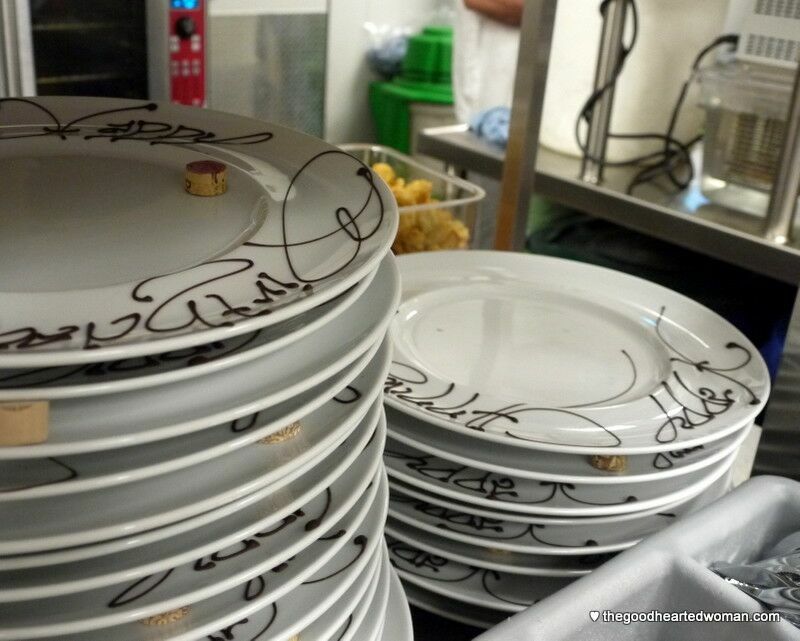 Plates decorated for special occasions are prepared ahead of time. Tickets are $200 per person, all-inclusive, with a portion of proceeds benefiting New Avenues For Youth. For full event details and to purchase tickets, visit RingSide’s 70th Anniversary info page. Throughout the month of June, Ringside is offering a delectable 3-course feast for $70 per person. Oregon Bay Shrimp Salad, made with butter lettuce, endive, celery leaf, red onions, and green goddess dressing. Fromage Blanc Cheesecake with strawberry balsamic jus. Disclosure: Mr. B and I are grateful to RingSide Steakhouse and The Little Green Pickle for inviting us to this event. Free food notwithstanding, we will always provide our honest opinion. The views and opinions expressed on this blog are entirely my own (and occasionally Mr. B’s). What a fun and yummy looking celebration dinner! 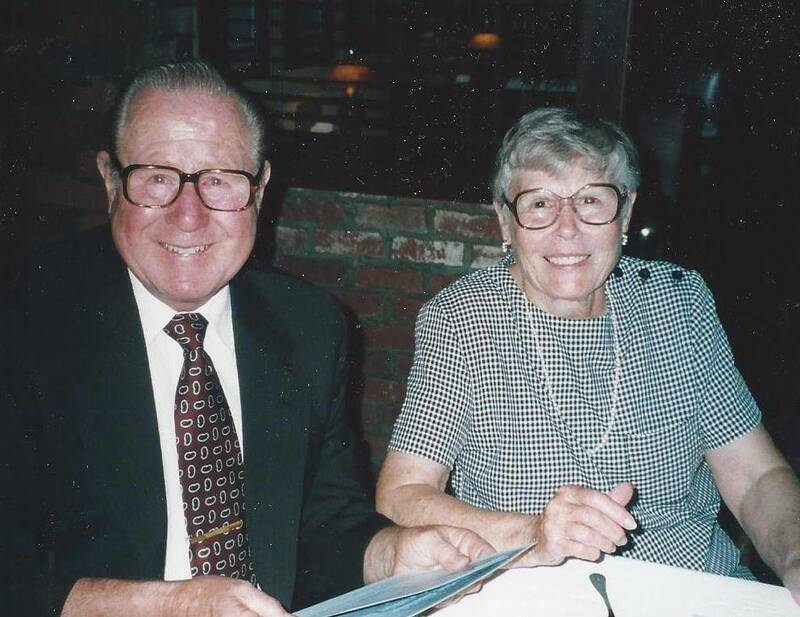 Sadly, my Dad died about eight years ago, but their anniversary is a lovely memory for our family. I think there was an issue in completing my comment, but I love that your parents have a restaurant they can continue to visit throughout the years. Aw love the pictures of your parents, they look so happy. I want to lick all of those plates…. and then eat all the chocolate truffles! Awe your parent’s story sounds so sweet! RingSide Steakhouse looks like a great place with some delicious food. Wow, that is incredible! What a great system and preparation for a restaurant. I guess that explains why they have been around and successful for so long! Your parents, so sweet! Wow! Looks so good! Wish I could try it! The food looks amazing – especially with your lovely photos! Will add this to my list of restaurants to try next time at Portland. What a fantastic place to celebrate such a wonderful occasion!! How awesome! 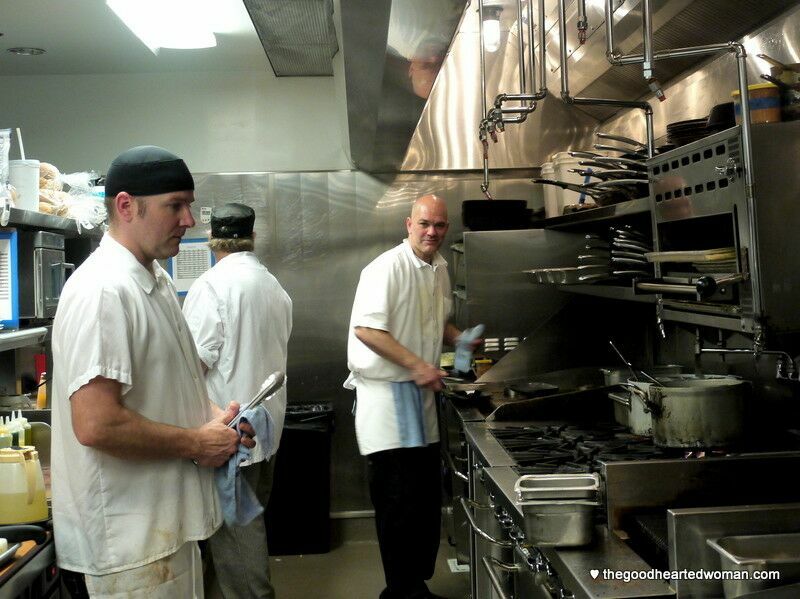 I’m from Gresham, and LOVE hearing about fantastic food downtown. I’m not currently in Oregon, but will have to check this out next time I’m in town. What a great post! This food looks so tasty! Your parents make a beautiful couple. I can see the love! Wow, what a lovely story! I think that’s really cool to learn that they make the plates pretty beforehand! That’s surprising to me.  Thanks for sharing. What an accomplishment! And it looks so yummy. Awww, what a sweet story about your parents! This looks like fun! I always love a steakhouse. Haha! 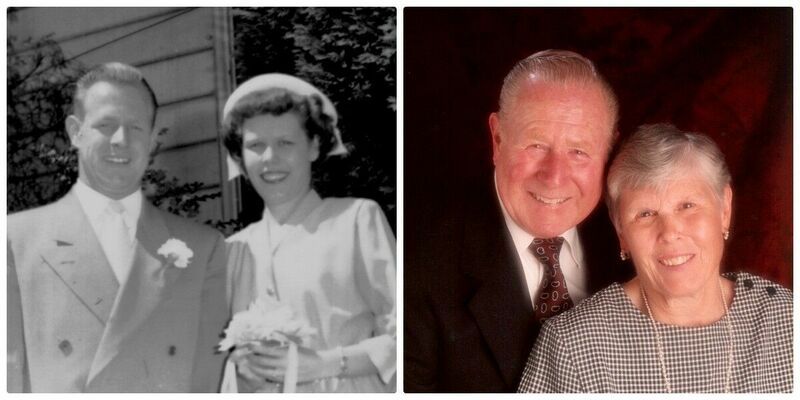 That story about your grandparents is so sweet! Their love story is too sweet! How awesome to celebrate in the same spot years later! Oh, what a great story. We haven’t been to Ringside in years. See your photos makes me want to go. 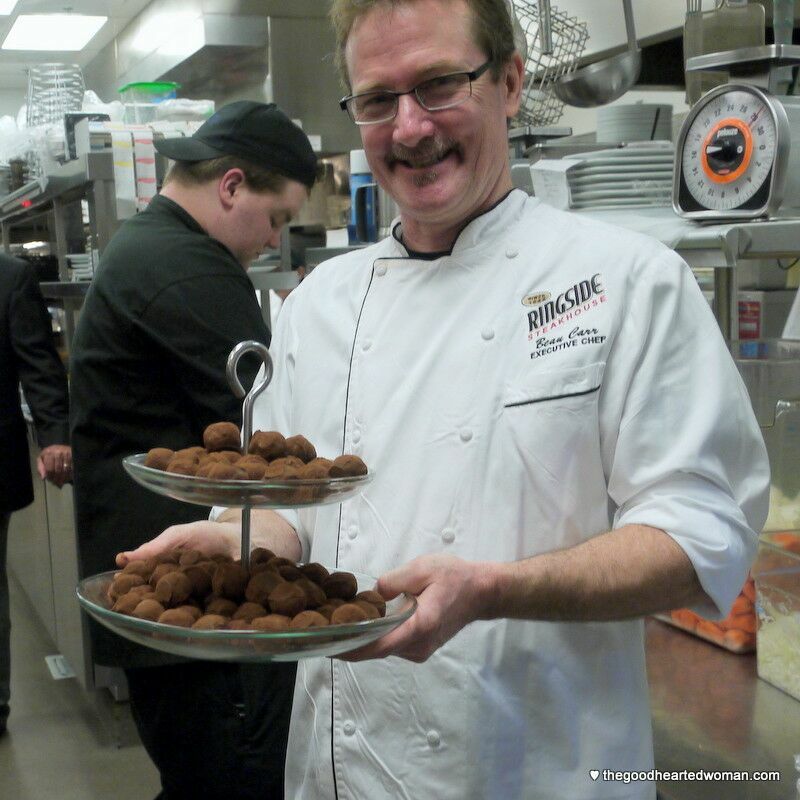 I really enjoyed getting the virtual, behind-the-scenes tour of Ringside Steakhouse. It really shows the thought and care put into each item on the plate. I hope they have 70 more years ahead of them!